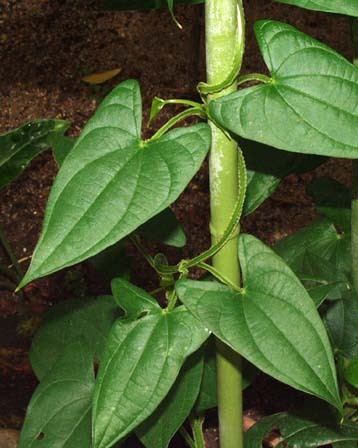 Greater yam (Dioscorea alata) is predominantly a tropical plant. The crop cannot withstand frost and excessively high temperatures. Temperature around 30ºC and rainfall of 120-200 cm distributed throughout the growth period are ideal. Day length greater than 12 hours during initial stages and shorter day length during the later part of the growing season favour satisfactory tuber formation. Yam requires loose, deep, well-drained, fertile soil. The crop does not come up well in waterlogged conditions. Sree Keerthi: Suitable for intercropping in mature coconut garden and with banana. Sree Roopa: Possesses excellent cooking quality. Indu: This is recommended as a pure crop and also as an intercrop of coconut in the reclaimed alluvial soils of Kuttanad. Sree Shilpa: This is the first hybrid having good culinary quality. The crop matures early, within 8 months. 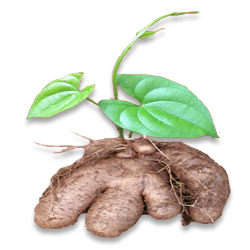 The tubers have 33-35% dry matter, 17-19% starch, 1.4-2% protein and 0.8-1.2% sugar. Sree Karthika: High yield, excellent cooking quality. The crop matures within 9 months. The tubers have 21.42% starch, 1.14% sugar and 2.47% crude protein. Greater yam produces mostly a single big tuber in which only one head end of the tuber is available as good seed material. For getting the head end in each propagation unit, the whole tuber is divided longitudinally. Each piece of cut tuber should weigh at least 250-300 g. Dip the pieces in cowdung slurry and allow to dry under the shade before planting. About 2500-3000 kg of seed material is required to cover one hectare of land. Plough or dig the land up to a depth of 15-20 cm. Dig pits of size 45 x 45 x 45 cm at a distance of 1 x 1m. Fill up three fourth of the pits with 1-1.25 kg cattle manure or compost and mix with topsoil. Plant the cut tuber pieces and completely cover the pit with leafy materials to conserve soil moisture and maintain optimum temperature. Yam scale is found to infest the corms both under field and storage situations. Trailing is essential to expose the leaves to sunlight. Trailing has to be done within 15 days after sprouting by coir rope attached to artificial supports in the open areas or to trees where they are raised as an intercrop. When grown in open areas, trail to a height of 3-4 m. Trail the vines properly as and when side shoots are produced. The crop becomes ready for harvest within 8-9 months after planting when the vines are completely dried up. Dig out the tubers without causing injury.